People of different professions who were living here during the liberation war were mostly followers of the Hindu religion. The chariot of Nabigonj, which traditionally took place in the bazaar was really famous and attracted a vast number of people from surrounding areas. Usually, people came here just the day before the “Monosha” or “Bishohori” puja to get prepared for the sacred day. In the year 1971, when the Pakistani army and their local collaborators (razakars) surrounded the bazaar around 5 pm with 13 boats, it was such a typical day of monsoon. In an average monsoon day, the rain falls from the sky. But, it wasn’t an average day by any means! The offenders opened fire, and it was “raining bullets”! Hindu or Muslim, no one mattered to them, anyone who couldn’t flee, died. At least 29 people were killed by Pakistani army that day. They plundered the “Kalibari” (a sacred place of worship for Hindu people) and dumped the Kali statue (which is worshiped by Hindu people) in the river that flew beside. They killed Suresh Chowdhury, the Hindu priest working at Kali temple too. Numerous rotten human bodies and corpses were found buried underground of the river bank. After the liberation war, a martyrs memorial is built here. 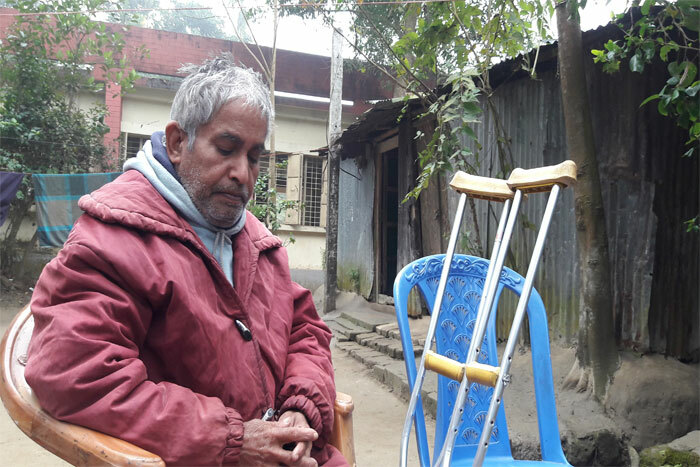 We interview Taposh Acharya who is a headmaster of a school now, was in class 4 when all hell broke loose. He along with his parents and younger sister heard the sound of weapons firing all night long. Later he knew, at least 29 people including the Hindu Priest were killed. With the fear of their lives they flew elsewhere and saw fire and smoke on the horizon. Pakistanis had burnt down the chariot! 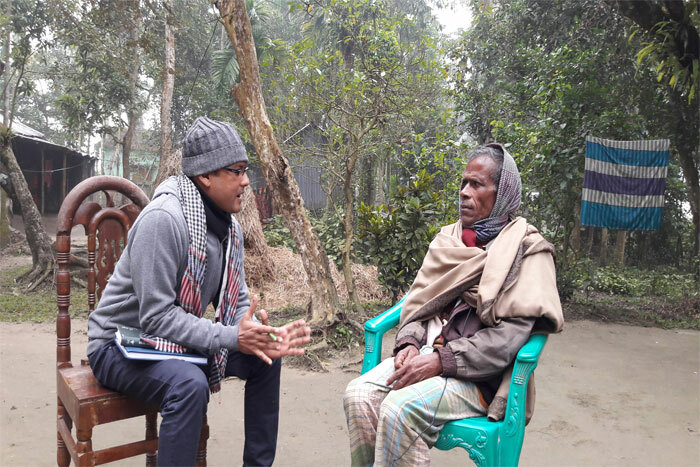 We also talked with Sajal Chowdhury, son of Suresh Chowdhury who was the priest and brutally killed by the army. This brave man who was just a nine years old child back then told us how he took his blind grandfather on the back and fled for life once his father was killed. He described how he hunted for his mom and brother and finally found them after one long month. 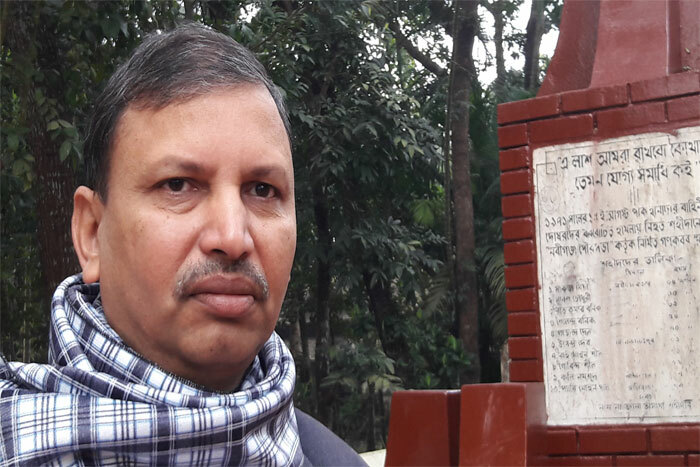 Apart from these, Shonkor Chandra Dev from Kanaipur told us how his father and elder brother were killed on that very same day at Nabigonj bazar. How he had to get the confirmation of their death from the same person who dug and buried his relatives. How he and other members of his family had to run for their lives from one village to another. The mass killings at Nabigonj and the insufferable time that followed is found in the speech of the eyewitnesses. Let’s hear from them.